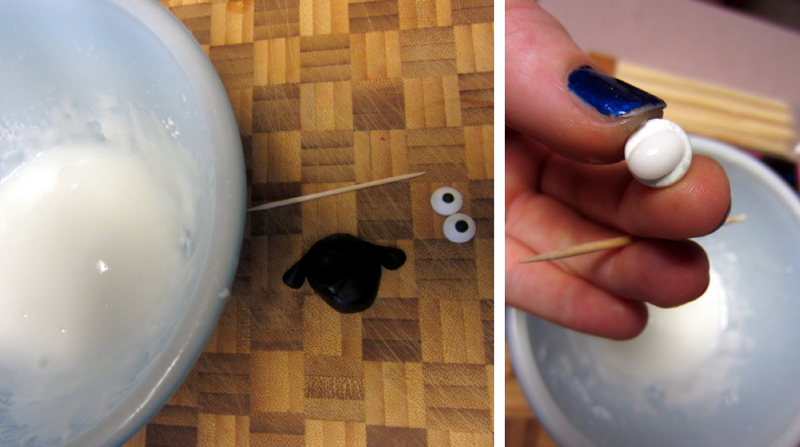 Some of you may remember that, once upon a time, I made some passable-looking Boston Terrier Cake Pops, yes? Well, not so very long ago, my sister asked if I would be willing to undertake the making of some more ovine pops in honor of an upcoming baby-shower. Always game for a challenge, I went for it! After making the cake pops (which are laughably easy to throw together – don’t let anybody tell you otherwise! ), I set about the decorating of the flock. CandiQuik (which I bought at Target!) and Wilton Fondant were my two major staples for this project. 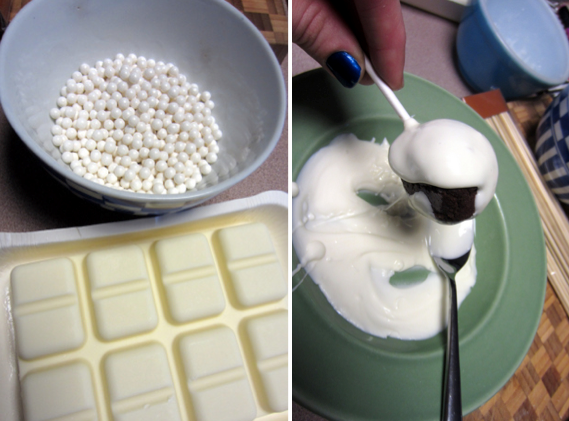 Don’t even bother with melting of white chocolate, it’s a lumpy disaster every time! 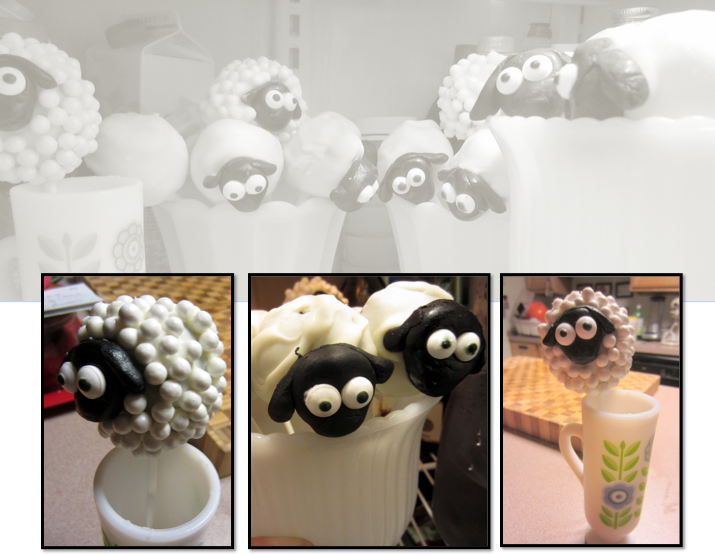 Also, without fondant, you would have some headless little sheepies, which is a little gruesome if you ask me. 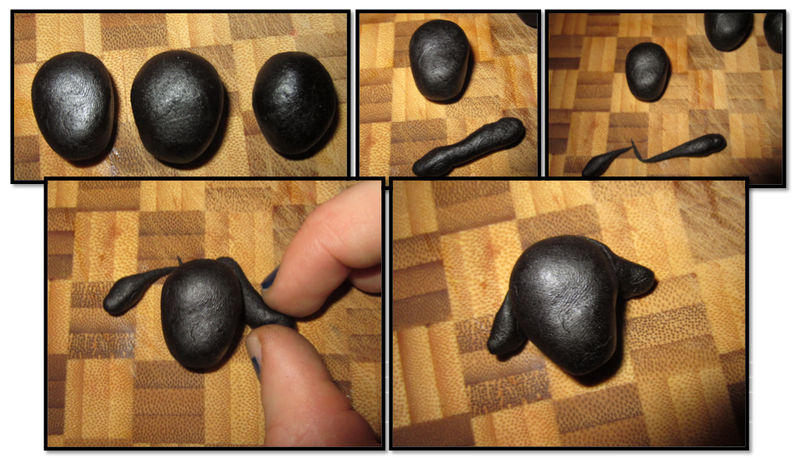 The black fondant was easy to work with and simple enough to form into little sheep heads with a quick process! Now, once there are heads, the eyes become extra important. I bought pre-made eyes, because I didn’t feel like piping anything out of a pastry tube this evening, but I don’t want them to fall off or pop out at the baby shower, so I mixed a little powdered sugar and water, or as I like to call it: sugar mortar. Just a teeny dab on the back of each little frosting eye helped everything to stick together nicely. After the heads were completed, I melted the candiquik and started to douse the cake-pops with white chocolate, making sure to attach a sheep-face to each one while I was at it! I made a few of the sheep coated with the small round pastry-decorations you see above, and they turned out adorable, but wound up being oodles and scads of extra work that I couldn’t bring myself to do for very long on a late Wednesday evening, so shorn sheep became a fast pop-decor choice! 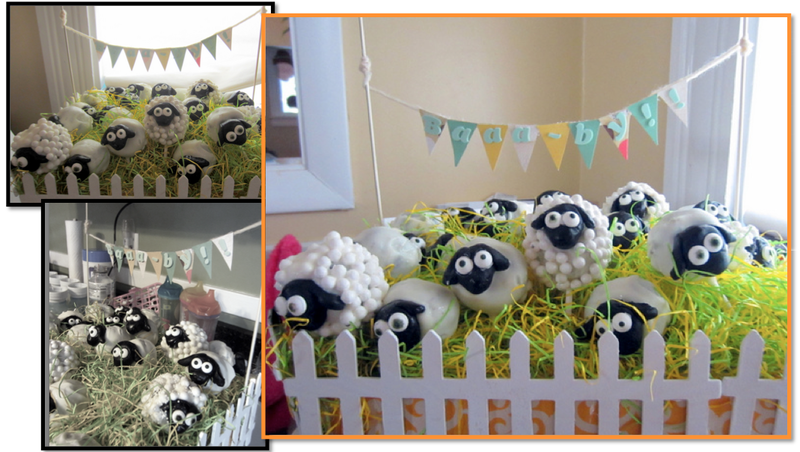 And voilà, the puffy little sheep are ready to be herded over to the baby shower and devoured by pregnant ladies (or, at least one!). Would I make these again? Absolutely! Definitely do-able!